Hatters defender Scott Cuthbert has declared he is raring to go to face Cambridge United this weekend, should the game beat the weather. The 30-year-old has been out of action since the reverse fixture at Kenilworth Road back in November, missing the last three months with a serious groin injury. 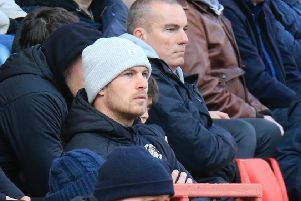 With the ‘Beast from the East’ already claiming the Newport versus Accrington game and a number of others expected to fall foul of the extreme freezing conditions, Hatters have still managed to get a decent week of training in according to the club captain. He continued: “We were able to train on grass Monday and Tuesday. "With the downpour of the snow the last couple of days it’s been tough to get anything on grass today, but we’ve got great facilities here. "The club has invested massively in the facilities that we’ve got and we were able to get a session on. "It was absolutely freezing, but we got a good session in and we’re prepared for the game Saturday if it’s to be on. “It’s not ideal, I think all throughout the country, teams are in a similar situation, so we class ourselves very lucky that we’ve got a very good astro pitch out there that we can train on. "I don’t think there’ll be a lot of teams that are able to train today, so that’s an advantage. "But when the weather comes in like this, we’re fairly fortunate over the last couple of years that we haven’t really missed too many games by bad weather. Both Hatters fans and Cuthbert have good memories of recent trips to Cambridge, with Town unbeaten in the league since 2000, a run spanning eight games. Luton have won their last three visits as well, with the skipper playing in the last two, as he said: “We always travel well there. "It's a local match, we get a good following, fill out that away stand, so it’s always a really good atmosphere and we’ve had some really good results. "It was 3-1 the first year I was here and then 3-0, so I've got good memories there, but they’re on a real good run of form. Meanwhile, on the threat of the U’s who have the towering Uche Ikpeazu as their top scorer with 13 goals this team, Cuthbert added: “They’re always tough games against Cambridge. "They’re very big, athletic strikers, tall centre backs as well, so you know what you’re going to get, if you can deal with it, then that’s half the battle. “He’s a strong boy (Ikpeazu), Jabo Ibehre is a strong boy as well, I’ve played against Jabo for years now. "You’ve just got to play the way we play. We’ve got a way of playing and it has brought us success so far this season, so there’s no point changing that, just to suit other teams.